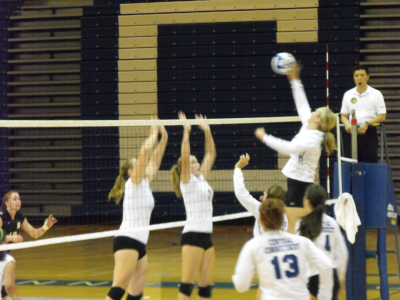 NEW BRITAIN, CT- The Bryant Bulldogs headed down to Connecticut, their second visit in three days, to take on the CCSU Blue Devils, and Central handed the a 3-0 loss in straight sets Saturday afternoon. Linda Sagnelli’s CCSU team kept up the pressure and fought off a late charge by the Theresa Garlacy’s Bulldogs in set 3 to take the win. Set 1 was a pretty back and forth affair even late into the set, Central got out to a 16-12 lead which it expanded into 20-16 lead and eventually a 25-23 win. CCSU ‘s highlights included a kill by Sara DeLacey from net, an Ace served by Kaitlin Petrella, followed by a second ace by Petrella and third ace by Petrella (she picked up a ton of Aces in the match), Jamie Rademacher had kill from net, later she added a smash, and again, Blaike King later whapped through the blockers, DeLacey received a set and walloped it in, Maite Mendizabal stuffed a Bryant attack with her block, King’s serve flew off the D and out of play for the ace, a good dig by Petrella on an ensuing play though Bryant picked up the point, Rademacher and DeLacey came up with a big block, Emily Cochran spiked a kill off the defense and out of play, Rademacher hurricaned another spike, Rademacher blocked a Bryant player’s attempt to pounce on an overpass on the next point, Cochran threaded a spike into the zone and in, Rademacher’s attack hit the Bryant block and flew over and out of bounds, and later smashed it through the blockers, Mendizabal ended the set with a bouncing ball off the defense and out of play. Bryant highlights included Emily Kaup landing a ball just in bounds, a service ace by Robyn Gardner, Kaup laced the ball in from the net not long after, Macy Mitravich had a kill cross court, Jadith Lorenzo had a misdirection set land in, a good save by Clyburn kept the ball in play leading to a Bryant point, Kendall Gaffney and Nicole Percz shared a block, Gaffney’s serve landed just on the back line for the ace, Lorenzo won a joust at the net, a good save by Gardner came later but CCSU got the point, Kaup whapped it off the blockers down to the floor, a good save by Lorenzo after a CCSU spike kept BU alive during a rally, Kaup and Clyburn shared a block, Clyburn got a set and hammered it in, Gaffney sent a hard shot in, and Percz and Lorenzo shared a block late in the set. Set 2 opened up evenly as each team reached a 12-12 tie, but Central exploded with a lead to 17-13 and let Bryant add in only a few points before scoring 25 themselves. CCSU’s highlights included Rademacher’s attack hitting a Bulldog and bouncing out of play, Cochran sent a spike sailing in front of a defender to the hardwood, Rademacher’s blast soon afterward was unreturnable, Cochran’s kill hit a Bryant defender and went far out of play, DeLacey walloped the ball from the net, Cochran’s spike followed, Rademacher’s light hit richocheted off an opponent and out of play, next point she launched a missile in, and she struck again right after, Rademacher regained the lead with a whack, a service ace by her extended it, DeLacey added a kill from the net after a set, a good rolling save by Bayer led to an eventual Blue Devil point, King’s whack hit several defenders and flew out of play, Mendizabal hit it lightly into the back gap, Mendizabal then ended the set with a kill off the blockers and out of bounds. Brant’s highlights included Kaup sending a rocket off a Central defender, Gaffney launched one which flew way out of play off the hands of a Blue Devil, Percz knocked the ball off the block attempt, Klein hacked the ball through a block, Gaffney added a kill from the net, Lorenzo added an attack to tie the set back up, Gaffney’s spike was not returned to cut the deficit to 1, a good save by Lorenzo occurred again after a long rally but CCSU grabbed the points, Gaffney popped it off the block and out of play, Lorenzo and Percz shared a block, Percz received a set and nailed it in late in the set. Set 3 opened to a 7-7 tie but Central then fought to a 16-9 lead, but Bryant battled back to a 23-23 tie. The Blue Devils closed the door with two quick points however to take set and match. CCSU highlights included Cochran’s spike hitting blockers and heading sideways out of play, Rademacher and Cochran put down an overpass, a good dig by Petrella on an ensuing play followed, Cochran served up an ace, King unleashed a thunderbolt into the defensive zone, DeLacey crushed it down from the net, Petrella landed the ball just in bounds for an ace, DeLacey and Rademacher picked up a block, Cochran’s spike hit the Bulldogs and bounced over and out, Petrella picked up another ace, DeLacey tomahawked an attack in at close range, Rademacher’s kill hit the block and it bounced off a BU player twice, a DeLacey kill bounced out of play, and to end it, Rademacher’s kill flew off player and into the seats. Bryant highlights included Percz whacking the ball off the blocker straight to the floor, Percz’s attack set in motion a CCSU attack error, a good dig came from Gardner on the next play, Lorenzo set the ball into a gap in the defensive formation, Kaup and Clyburn cooperated on a block, Clyburn typhooned a kill off the Blue Devils out of play, Gaffney whammed the ball off the home team’s block effort, Gaffney whapped the ball off a block, Percz tapped it down, Clyburn delivered a straight kill in, Gaffney spiked the ball in with success and added another point, Lorenzo hit it off the blockers late. Central and Bryant are both in action tomorrow. Women’s Volleyball: Cincinnati tops UConn in 3 sets.